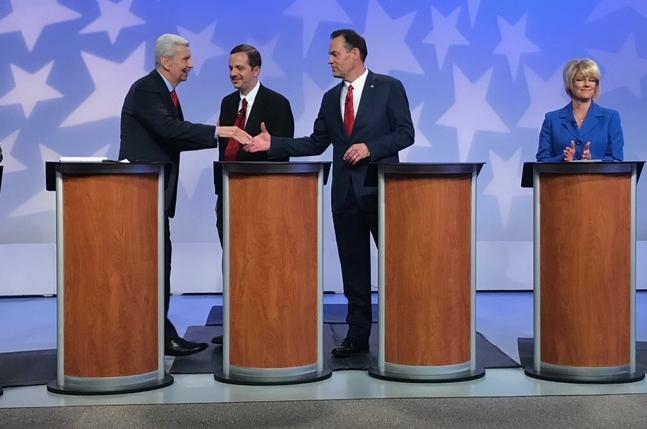 When six GOP candidates for Idaho’s open 1st District congressional seat faced off in the “Idaho Debates” last week, much of the fireworks – and the humor – came in the closing statements. Leroy had this to say at the beginning of his statement, followed by a dramatic pause: “With my last breath…” The studio audience, cautioned to stay silent, laughed anyway. Rep. Luke Malek, R-Coeur d’Alene, the next one to speak, is bald, sporting a shaved head and beard. “Dave, I don’t think Washington needs more hair,” he said to laughter as he opened his statement. Candidate Alex Gallegos stayed out of the fray, instead focusing on how people have told him that as a first-time candidate, he faces an “impossible challenge.” “The people that told me that must not be from Idaho, because Idahoans thrive on challenges,” he said. Voters across the state received a fat 48-page newsprint publication in the mail this past week – mine was addressed to “resident” – calling itself “The Idahoan,” and purporting to be a newspaper that is published only right before an election – complete with endorsements of far-right candidates in the May 15 primary, multiple ads for the Idaho Freedom Foundation, editorials decrying certain Republican candidates as too moderate, and multiple typos, including one misidentifying the election date. The publication and its accompanying website identify longtime GOP campaign consultant Lou Esposito and Patrick Malloy as the editors and publishers, but the original filing with the Idaho Secretary of State’s office for The Idahoan was made by none other than Wayne Hoffman, now president of the Idaho Freedom Foundation. “It used to be Wayne Hoffman’s DBA; he’s terminated that,” Idaho Secretary of State Tim Hurst said Thursday. “The Idahoan LLC is Patrick Malloy.” According to state records, Hoffman terminated his use of the business name on April 19, the same day that Malloy filed to use the name. The cost to send out this large mailer statewide had to be substantial. Idaho’s much-smaller voter pamphlet, which is a pamphlet of a few pages that also is printed on newsprint and mailed out statewide when there’s a constitutional amendment on the ballot, costs about $200,000, Hurst said. “The Idaho Democratic Party believes that certain conservative political organizations are funding The Idahoan and are attempting to circumnavigate campaign and election laws by improperly classifying The Idahoan as a newspaper,” said a letter from attorney Sam Dotters-Katz, on behalf of the party, to Idaho Secretary of State Lawerence Denney. The letter also called for Denney to recuse himself from the investigation, because of his past campaign dealings with Esposito. Hurst said Friday that Denney had received the letter. “We’re going to discuss it with the Attorney General’s office,” he said. Idaho’s Sunshine Law requires reporting of who’s responsible and how much they’ve spent when electioneering communications are sent out to voters before an election, but newspapers and periodicals are exempt from those requirements. I start my new position as Boise bureau chief and state capital reporter for the Idaho Press-Tribune and Adams Publishing Group, which also owns the Idaho State Journal, the Idaho Falls Post Register, and a number of smaller Idaho newspapers, on Monday. I hope you’ll continue to follow my work – some of which will still run in The Spokesman-Review – and also all the other fine news reporting in this great newspaper. We need the free press in our country. Support it!